Sarah is amazing at sourcing hotels – and by gosh, she excelled even her own exceptional standards with this one. Each of us who were paired up had not only a room to sleep in, but a massive living room / kitchen area too. The hosts even gave us a little introduction to explain everything in what ended up being Mark and Amanda’s room. This ended up being our party room – with a very reasonably priced self-service bar outside we felt little reason to head out too early.. soon enough Les and Dave had joined us, and Ken too to get his hair spiked up by Karen. But we were, after all, there for a gig – so we hit the streets in search of some food beforehand – finding Geoff at a Mexican place a couple of doors down from the venue, and joining him for some rather lovely food. 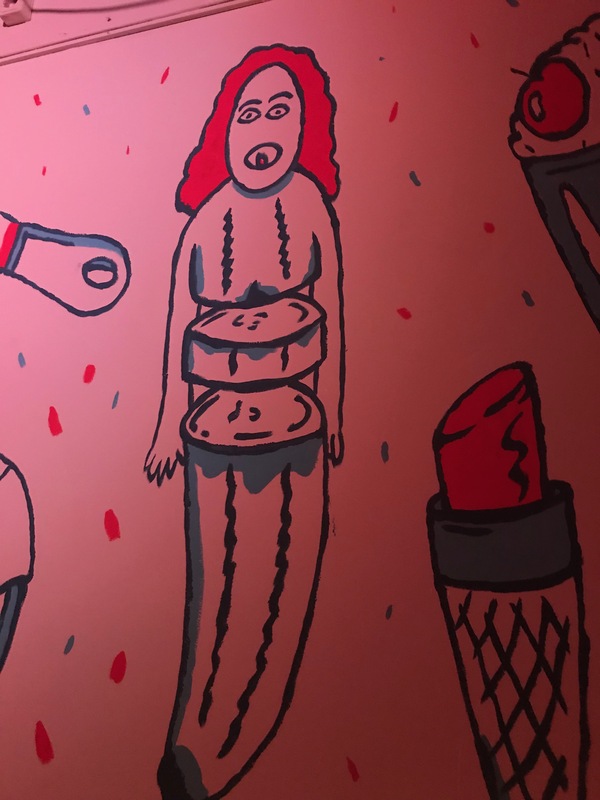 Upon getting in the venue we found a bar with curious wall art, and a mysterious curtained off room beyond. There was an odd curfew situation meaning they couldn’t start live music ’til after 9:30 and I think that included soundchecking too – so the band were getting their levels right ’til a little after 10pm when the room beyond was revealed. 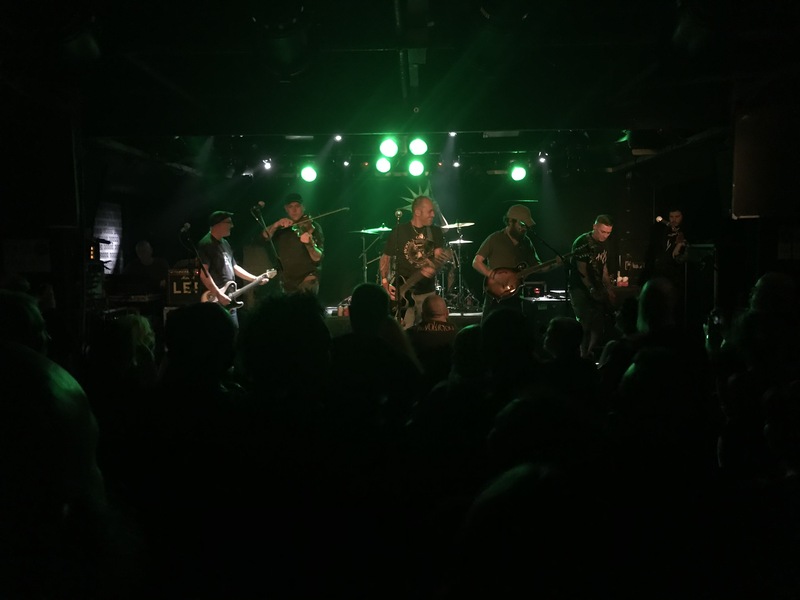 A similar sized space beyond, so definitely on the intimate side – and a low stage (more on that later), the intro music boomed, Ferocious Dog took the stage and they launched into Spin and then American Dream. The first thing I’d noticed was John A now has a mic too, and there’s much more backing vocals all round – this would come into play more over the weekend. The band were sounding tight though – there was a lively crowd, and a cracking atmosphere. 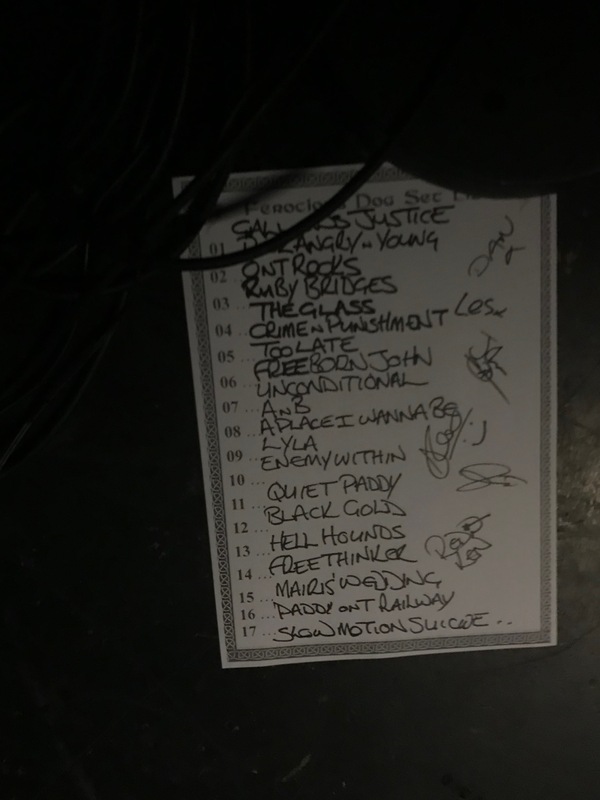 I did snap set lists but will probably not focus on that maybe ’til the last gig which I sat back for. Dean had decreed I’d not surfed for a while, so I got that particular job for the night – I was a bit wobbly, he’s right – it has been a while! No damage done though, and a decent dismount! Although at some point I was thundered back into Ken’s monitor which gave him a microphone to the teeth – sorry Kenny! It as funny watching John L dancing with his microphone during Quiet Paddy, he lowers it for the whistle parts, runs off to smash a cymbal with said whistle then comes back to practically wrestle with it to do his vocal parts. 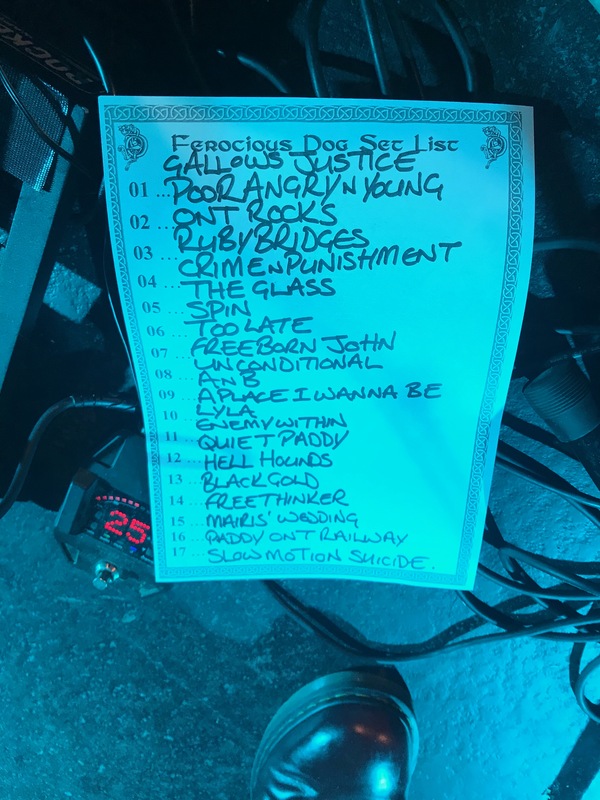 You’ll note the set list has Enema Within written on it – comedy gold! Other highlights were the mood shift for the very harrowing A&B, Dan gets more and more confident on lead vocals and John L accompanies beautifully – and then the calm-to-vitriol of Les’ vocals in A Place I Want to Be is another nice juxtaposition to just having purely one vocalist. I really like all these extra layers and flourishes to keep things a bit fresh. An excellent set, we hung around for a few drinks by the time we’d wandered back to the hotel most folk had gone to bed! 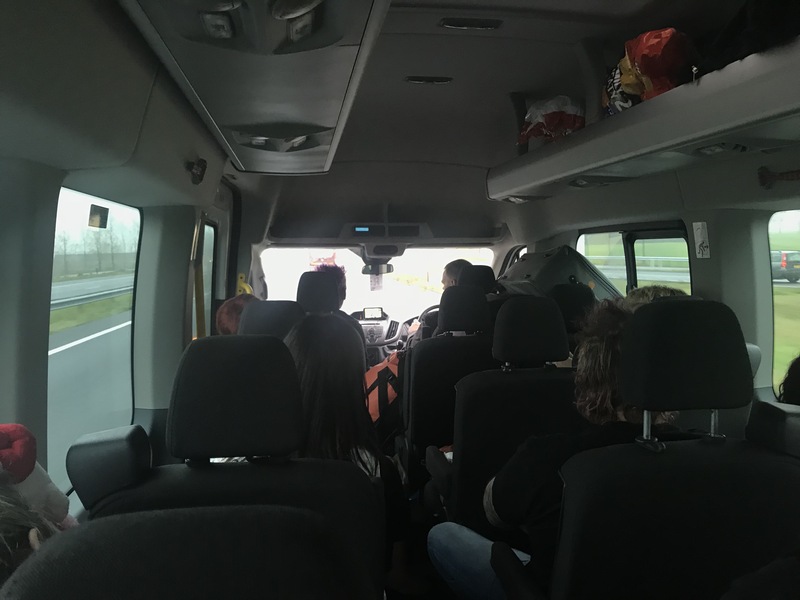 The morning of the Rotterdam gig started with an epic breakfast in Nijmegen at our hotel – we’d asked that all of us breakfast in the one room rather than the customary delivery of a breakfast to each room and it worked really well. A huge continental feast set us up brilliantly before heading back on the bus to double back on ourselves to Rotterdam and find our hotel – it was sorted quickly and we wandered into town to find some food and drinks. What started with one tray of Limoncello from Paul descended into a bit of a shot-fest – Karen amusingly looked me square in the eye and said ‘You used to be thin, didn’t you?’ much to the hilarity of, well, all of us really – she was mortified. Naturally we kept bringing it up all weekend, haha! 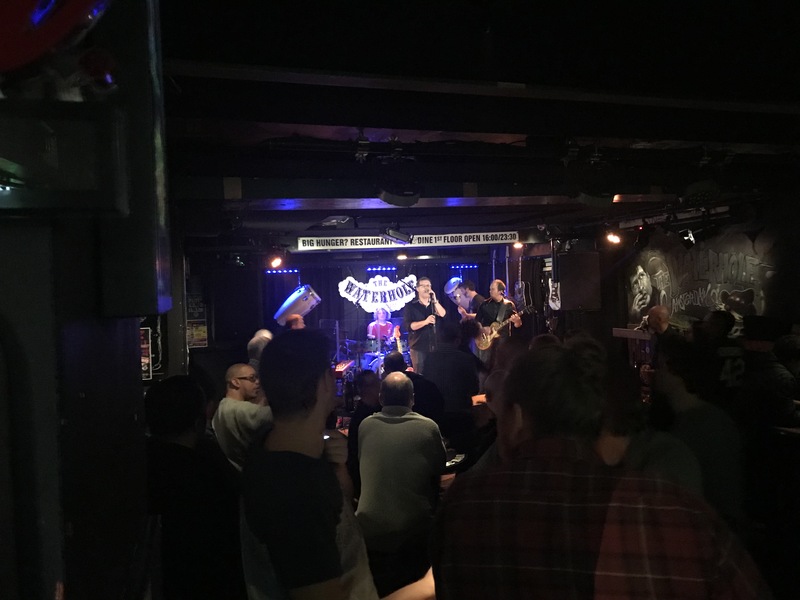 We’d let time run away with us a bit so we opted for fast food on the way back – Lynne had lost her wallet so we nipped back to the bar to see if we could find it, with no luck, before heading back and eventually to the gig. For this evening we had support in the form of Bunch of Bastards – they were great fun, really lively and clearly appreciative of the crowd too. The venue was an odd one, a bit far out and had a token system for drinks which were a bit limited (probably a good thing considering!). The only song titles I picked up were The Skies over Rotterdam, Bastards Song and a rowdy cover of Whiskey in the Jar. 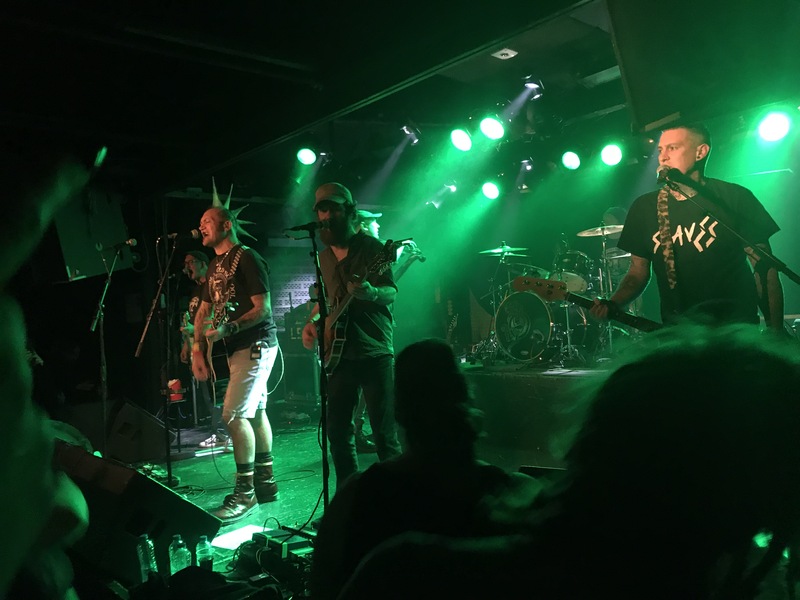 Excellent fun set to get the crowd warmed up ready for Ferocious Dog to come on. 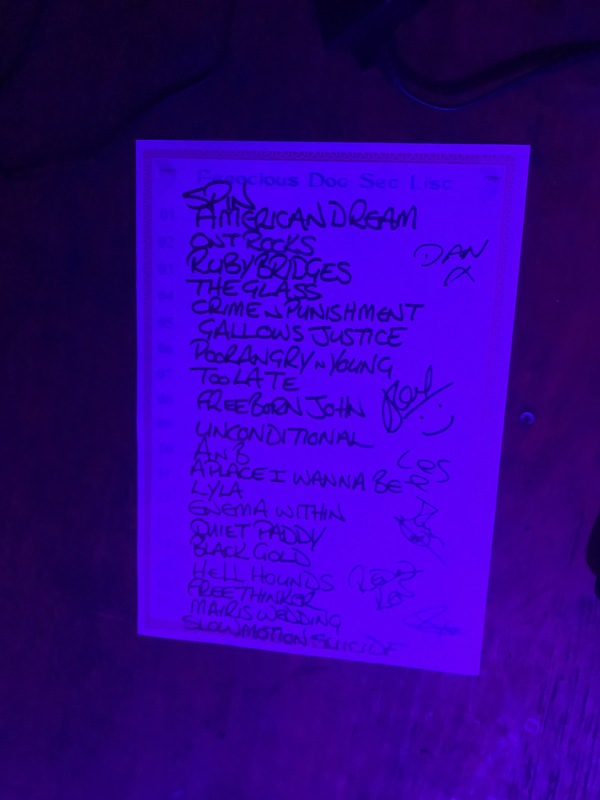 They’d mixed up the set list this time, with the more traditional start of Gallows Justice and into Poor Angry and Young. It was a nice sized venue with plenty of people but not too full, and a good bouncy crowd of both travelling fans and locals alike. Dean had decided Mark should make a maiden surf, so we arranged that and it was a splendid debut – it must’ve been a surprise for Ken as I’m pretty sure the first verse went awry! Always handy to have a lighting rig to grab on to when you wobble a bit too! For me hearing songs like A&B and A Place I Want to Be more were welcome highlights – the more obvious showcases of increased diversity in songwriting and performing in the set, and growing confidence from Dan and Les on vocals respectively. Having said that, early in the set it was good to see On The Rocks continue to make a bit of a resurgence having been omitted from quite a few sets for a while now. With three albums under their belts now there’s plenty of scope for really mixing up a live set these days! 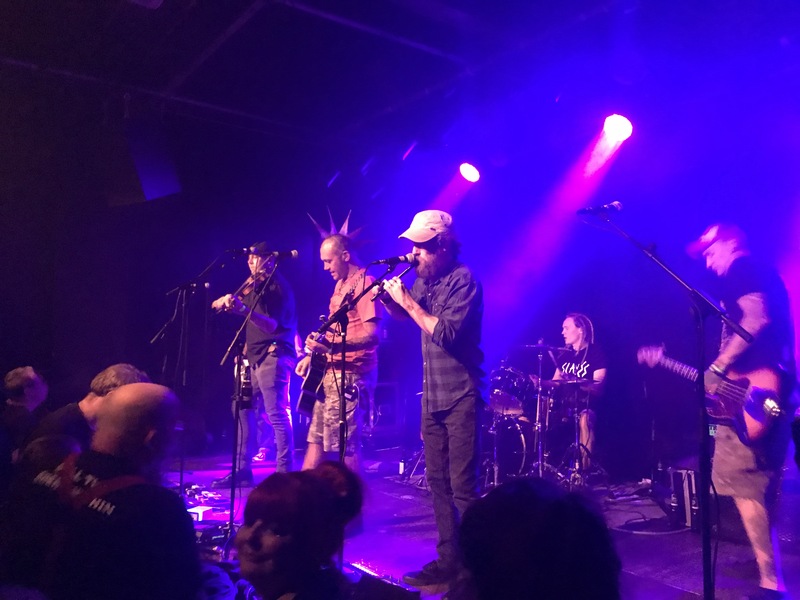 At the end of the gig the DJ had his crowd pretty well measured – we were treated to the likes of Nelly the Elephant and Holiday in Cambodia before eventually taxiing back to the hotel. I had helped one Dutch lady track down the band to sign her album, she’d found Ken but eventually we got hold of the rest (and a Sharpie from Leanne!) which was a nice thing to do. Alex was really excited that he’d get to sign an album he’d actually played on soon! Back at the hotel we settled in the bar and enjoyed the wonder that is Bobby’s gin with tonic, served with orange and a couple of cloves lobbed in. After a few of those it was time for bed, one up in the morning I’d noticed a couple of missed calls from a local number which initially puzzled me – then remembered Lynne’s missing wallet, so I called back – they’d found it, sadly emptied of the cash that was in there, so a disappointment for sure as we piled onto the minibus to head onward to Den Bosch (or ‘s-Hertogenbosch if you insist!). 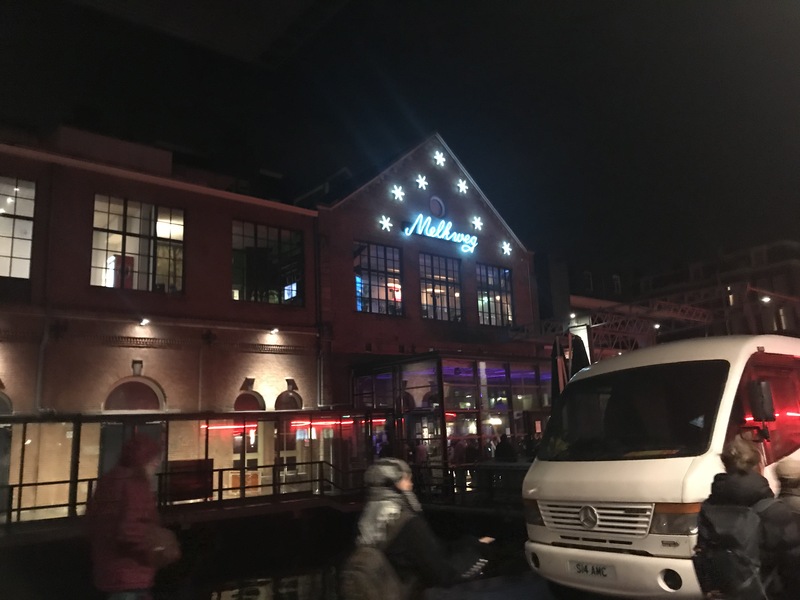 We checked in to a very swanky looking hotel indeed, once we’d got everything offloaded we settled in the bar for a quick drink – which took ages! Luckily some of the group, led by Paul’s stomach – ha – had found a superb place for food. We ordered from the very reasonably priced set menu (well, most of us did!) and were served up a veritable feast. If you’re in Den Bosch then hit up Samy’s for sure – it was really good snap and reasonably priced. We might have been silly with the light up LED candles. In the town there were lots of brass bands and folk wearing colourful scarves, patches and sometimes frogs adorning their clothes. It made for a jolly atmosphere as we headed back to the hotel, then onward – we’d intended to stay close to the hotel but somehow ended up near the venue, nipping to the nearest pub and finding plenty of other travelling friends, it was a nice bar, although no tonic water for Gin Club (although they did nip out and get some during the gig as they had it after, haha!). 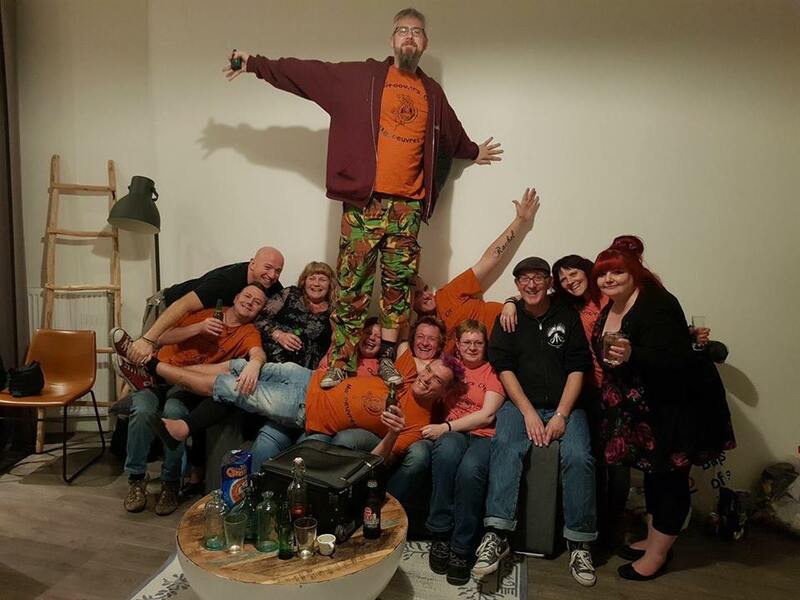 After a few drinks it was to the venue in time for Drunken Dolly, I’ve heard lots about them as they supported FD back in February but aside from a few listens via YouTube I hadn’t seen them yet, aside from in the mosh pit in Rotterdam! They were superb. 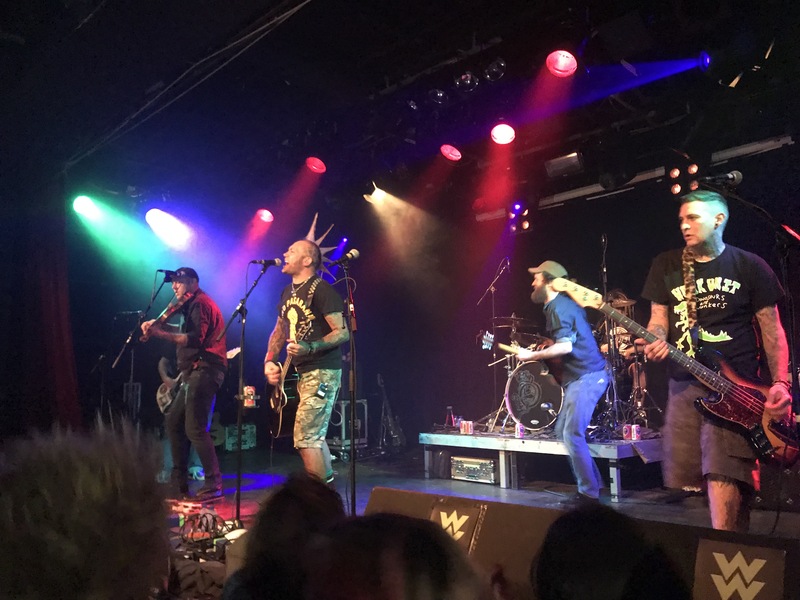 They reminded me of The Roughneck Riot at first, but much more rock than folk – but there was much more variation in vocal contributions, singing, backing – harmonising, it was very clever and very catchy stuff. I’m afraid I couldn’t tell you any song titles – I opted not to pick up CDs because well, I’d probably have broken or lost them – but will be getting some of their stuff digitally once payday arrives. Hopefully we’ll get to see them over this side of the sea as well. 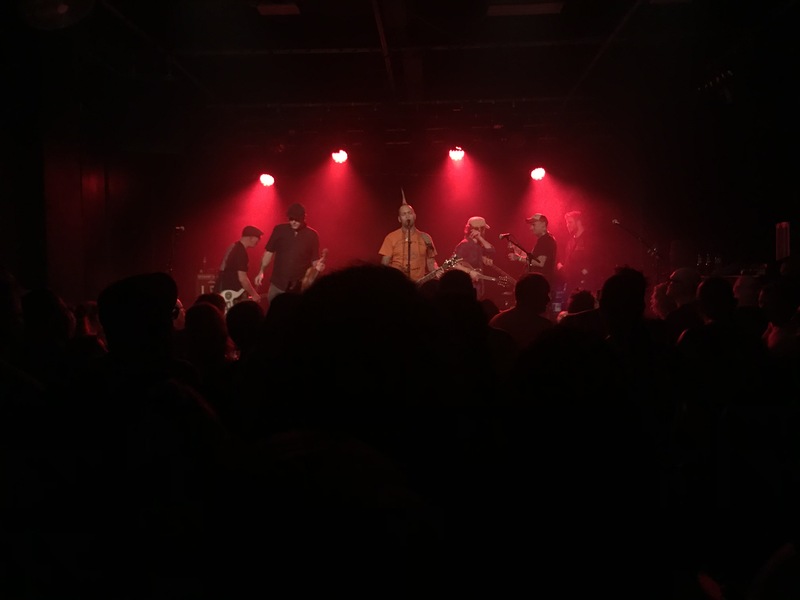 I was pretty confident that I’d like them from what I’d read and heard already – but it’s fair to say they actually blew me away, a properly excellent support act and ones to watch out for should they venture over to the UK. Ferocious Dog took to the stage next – and after the intro when Gallows Justice kicked in it was pretty apparent that Ken’s voice was struggling a bit, he soldiered on though and it didn’t detract at all – utilising the backing vocals of Les, John and John to pick up the slack in some high bits (and of course the crowd are always on hand to lend a hand!). 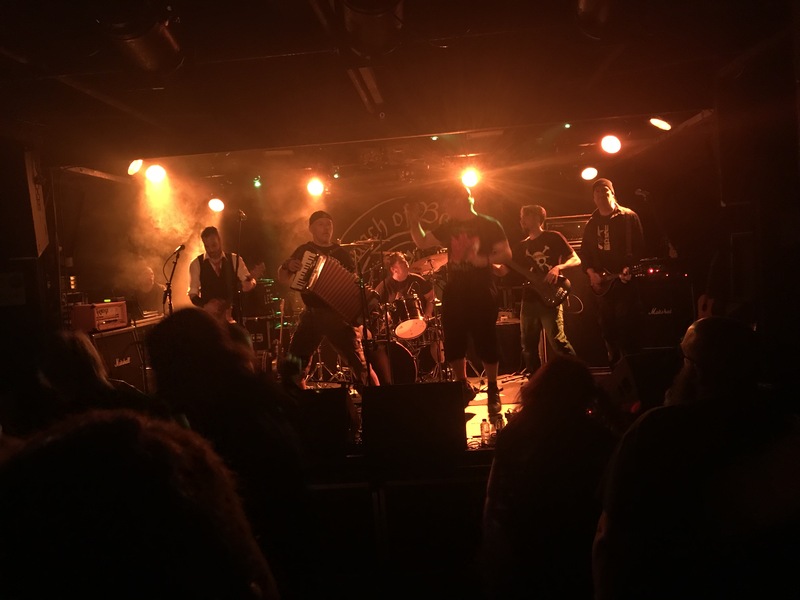 There was a good mixed crowd with kids and adults alike, moshers or dancers alike – Dave had a little lad on his shoulders for a bit, later on the same lad was dancing on stage to Mairi’s Wedding Part II. Nadine took a turn to surf this time for Freeborn John and did it with customary style and grace! There wasn’t quite time for Paddy on the Railway which was a huge disappointment to Sarah, and a really rocked out finish to Slow Motion Suicide. Another top evening’s entertainment, we headed back to the pub and eventually most of the travelling fans and the band were around – Kenny had written ‘can’t speak’ on his hand – although couldn’t help but express his joy at Mansfield winning and the rugby result which I quickly looked up for him. We drank a lots, laughed lots then stagged back through the town to the hotel via a pizza and chip shop. A really fun night. Which leaves Amsterdam as our final destination of the weekend. Breakfast was a bit subdued – this (and Rotterdam to be fair) were probably our ‘big’ nights – although a very good selection of self-serve offerings soon started to perk us up a bit. Once we’d packed up we reconvened with the minibus that Stuart and Dean had been to fetch, and off we went – initially dropping Mark and Amanda off at the airport as they sadly had to leave us for the last night (there was a silver lining here – it gave me the whole back seat of the bus to loll on!). Once in Amsterdam we were staying in the same place as last year, which was great – we even snagged a parking spot right outside again! We headed into town to find the band having some dinner and grabbed a couple of drinks, it was definitely a steadier day than before! With time ticking we nipped down the road for a curry to charge us up a bit, it was really good! 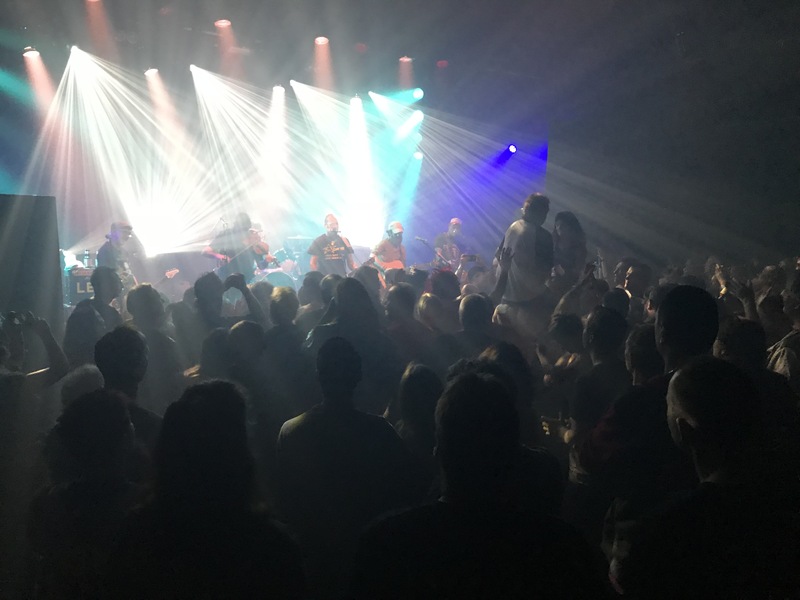 There were around three events on at The Melkweg that night, and it was bedlam outside with a larger gig, some kind of cannabis convention and FD upstairs. We gave up on the queue and nipped back to the bar for drinks whilst it died down where a band called The Jones were playing 80’s classics! After we nipped out again we found a way in and upstairs to the smaller room Ferocious Dog were playing in, what a great room it was too – the enticing balcony with chairs was closed off and despite trying to get them to let us up there they weren’t having it. 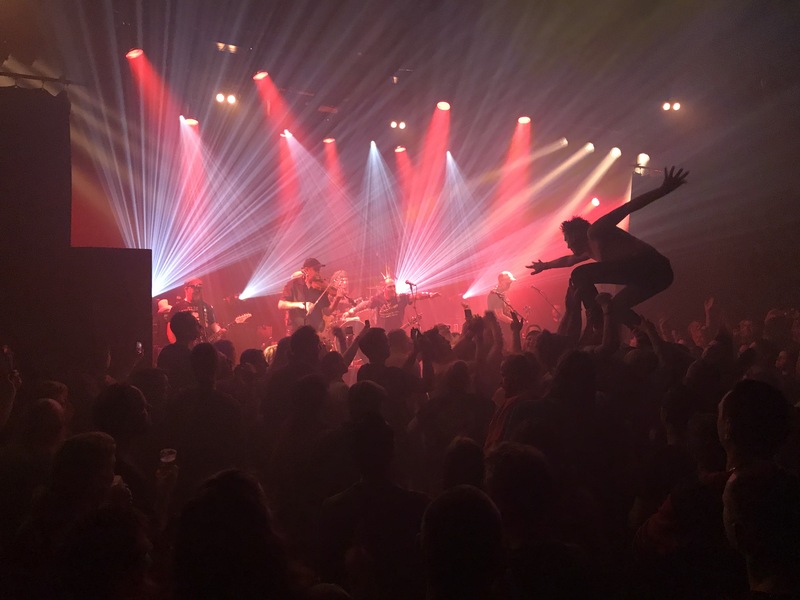 I wanted to sit back and watch a set in full, partly because it’s nice to do that now and again and not least because I was bloody knackered – and there were plenty of moshing types to pick up the slack of one person missing in action (or out of action!). Eventually Jacquie sussed a great spot for us to settle, and since I actually watched this set properly from on high I’ll go for my more usual song-by-song appraisal. After the intro music Gallows Justice kicked matters off, and into Poor Angry and Young. Ken again was in decidedly growly mode, bless him – there was some lusty backing vocals kicking in from Les in particular (plus a lot of crowd singing along). On The Rocks kept its place and then it was on to Ruby Bridges. For Crime and Punishment Barry was finally granted his wish (whilst dressed up as a convict) and was hoisted up on to Dean’s shoulders for his favourite song, this was followed up with Spin and then a pause as Ken contemplated whether he could manage his way through A Verse for Lee, eventually he did and the crowd helped to carry it through – a very moving moment, it always is – this time for a mixture of the emotional and physical factors inhibiting Ken’s ability on the night. That of course kicked us into The Glass and Lee’s Tune which got the crowd bouncing again. Too Late saw both Paul and Nicki up separately on shoulders which was nice to see, the former had been doing a sterling job on merch for much of the weekend so it’s always nice to see him venturing into the mosh pit. He was immediately hoisted as a surf board for Dean for Freeborn John. Nobody surfs quite like Dean, so hopefully his frequent claims of standing down from doing it are as inaccurate as they’ve been so far! Unconditional was up next then mercifully a break for Ken’s voice with A&B led by Dan and ably backed by John L – this was the most confident rendering I’ve heard of it yet. Spine tingly and very moving. 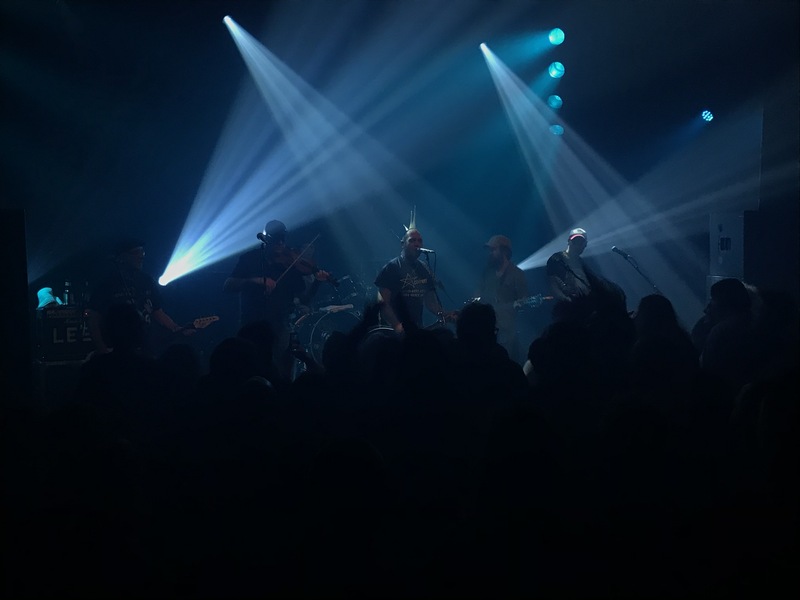 For A Place I Want to Be Les was properly on it, I love that the band dip in to do backing vocals for the ‘yes!’ and the end of ‘choices’ – but come the shouty bit and well, I hope it was as cathartic for Les as it looked to be – he was really giving it some! For Lyla the crowd carried the high bits – with Big T asleep in the Dog Bus preparing for a long drive John L got the crowd to ‘do the roar’. American Dream snuck back into the set having been missing since Nijmegen – Stuart had been roundly complaining about this, clearly Ken had taken note as he dedicated it to him. Sadly he’d taken a bash on the leg so had to enjoy it from the merch stand rather than in the mosh pit. 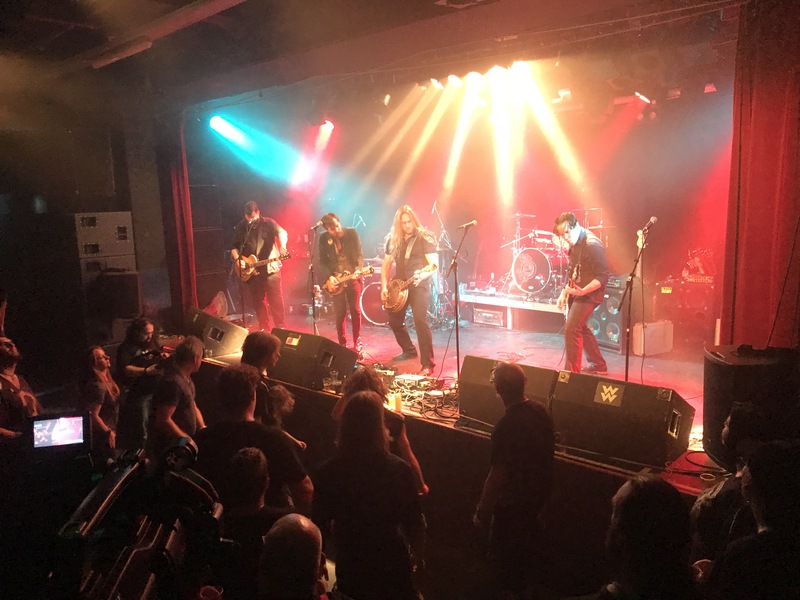 Black Gold was the last of the new songs before we got to the kind of traditional run through to the end of a set – Quiet Paddy, Hell Hounds, Freethinker (with a pretty amazing circle spreading out over most of the dance floor!). The set proper came to an end with Mairi’s Wedding Part II and the stage blacked out to rapturous applause. The band left the stage but were roared back on for a triumphant encore of Slow Motion Suicide. (I videoed it as a bold claim was made about this finalé which was apparently piked out of by a certain fiddle player!). It was a cracking set in a great venue, it was good to take one in from a distance after a hard few days of partying! I invested in a Ferocious Dog cushion to take on the minibus and with a ridiculously early start to make our tunnel crossing we decided we should rush to get back to the hotel. Of course, it never quite works out like that but eventually we made it back – and a quick drink to chill out and headed to bed making sure everyone had set alarms to get us up in time for a 5:30am set off in the morning. Everyone managed this, and we were off and made it to the tunnel crossing (I might have been asleep!). A heroic drive from Dean and Stuart got us up through England and back to Jacquie’s to bring an epic weekend to an end where it had begun for us. An absolutely amazing time was had by all – we are very lucky. 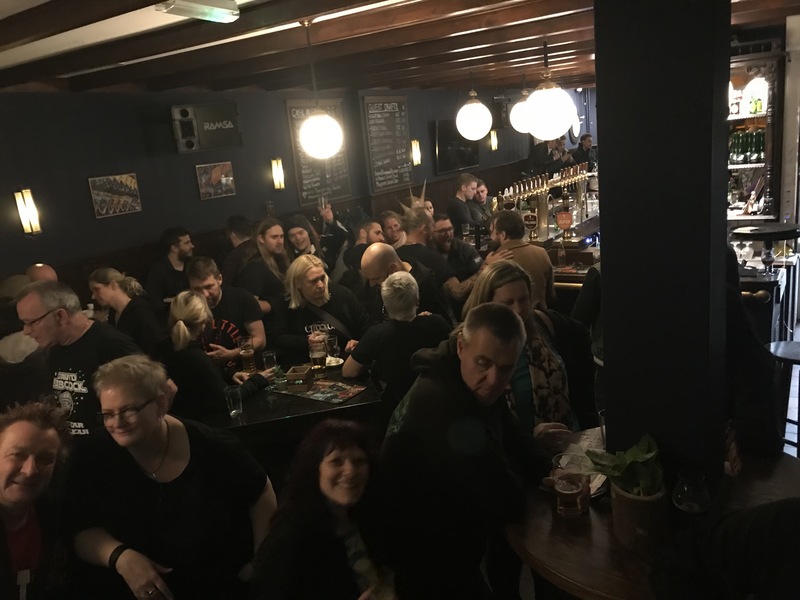 Huge thanks are due to Dean, Sarah and Stuart for their logistical skills and of course the band and crew for venturing out to exciting places for us to go watch them. Upon getting home the new album was waiting for me, so I will get around to writing that up too at some point! Another fun excursion amongst our European Ferocious Dog following friends, and another successful mission I would say!